Our fantasy helmets offer the same great quality as all our historical helmets. Some helmets are purely display armor pieces, however most of our fantasy helmets are wearable, functional and battle ready just like our historic helmets. Some helms are customizable to your measurements for a perfect fit. We carry a wide variety of helmets to choose from including, Steampunk helmets, Viking helmets with horns, Barbarian helmets and Medieval helmets. These fantasy helms are great for collectors and re-enactors alike. The Dark Lord rides in force tonight. Now you can join him as his lieutenant wearing our new steel Fantasy Mask! Custom made to fit, this hand crafted armour mask comes black from the forge. Our Conan the Barbarian: Helmet of Thorgrim by Marto is the Official Licensed replica of the Helmet used by the warlord Rexor in the Conan the Barbarian movie. Our Conan the Destroyer: Helmet of Queen Taramis by Marto is the Official Licensed replica of the Helmet used by evil Queen in the Conan the Destroyer movie. The Helmet of Taramis was painstakingly recreated by the masters at Marto and is a full size, top quality movie replica Helmet. Our Armageddon Helm shows "The past is our future". This awesome helm is steel adrenaline... and its ageless style will last you to the very END. Don this helm and face your destiny! With our Heavy Armor Winged Functional Viking Helmet you will swear you found a long lost artifact from a real Viking stronghold as you relive the life of a Viking conquering warrior with this 14 gauge Viking helmet with cheek plates. The Horse Lord Helmet is constructed from 18 gauge steel and is edged and adorned in brass trim and etched design. The blackened interior has an adjustable leather suspension liner. Adjustable chin strap with a brass buckle and a plume of horsehair complete the helmet. Our Official Conquest Undead Helmet with Chainmail matches the ConQuest Undead Armor Set. Made from darkened metal this armor Helmet is an Official Conquest LARP item. The Viking Horned Helm is a Spangenhelm design with fantasy horns, shaped hinged cheek pieces and neck guard. 18 gauge steel. Our Medieval Armor Skull Helmet comes from the depths of medieval hell. Worn to intimidate enemies in combat. It is a magnificent armor helmet. Crafted in 18 gauge steel. Is our Visored Helmet from the East?...West? or perhaps the origin lies in an ancient warrior culture, this incredible helm dates back to unknown time and origin. Viking helmet with horns Horned Viking Helm. You will swear you found a long lost artifact from a real Viking stronghold as you relive the life of a Viking conquering warrior. The Barbarian helm is full size and it comes with the stand. The Hound's Helm is a replica of the helmet Sandor Clegane used in the HBO series and is an official Game of Thrones licensed product. 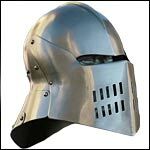 Our Unsullied Helmet from A Game of Thrones is now available. Former slave soldiers, the elite Unsullied were freed by Daenerys Targaryen and now serve her in her quest to reclaim the Iron Throne of Westeros. Visored Bascinet Helmet Dark, a fantasy version of the knight's helm. Helmet offers full face protection with locking detachable visor. Constructed from darkened 18 gauge steel and comes complete with an adjustable, black chin strap. Ratio helmet, a fantasy based Asian styled helmet. You can wear this helmet in 3 ways giving you an original look according to your style. Articulated rear lames, cheek guards, removable face guard. Adjustable, black chin strap.